On Wednesday, Manchester United became the only team in the history of the Champions League to come back after losing 2-0 at home in the first leg. The Red Devils beat Paris Saint-Germain 3-1 on their own turf and went through on away goals. After witnessing history, all Manchester United fans on Twitter want Solskjaer to get the job. Solskjaer was appointed as the caretaker manager of Manchester United in December and the Norwegian has turned the fortunes of the club drastically. 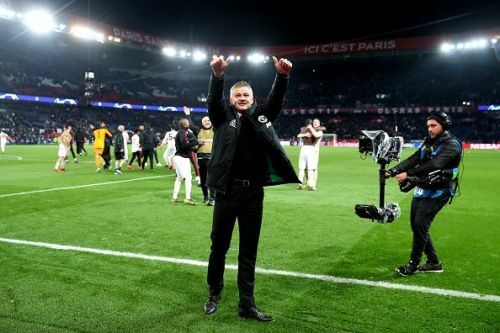 This Manchester United team has now beaten Tottenham Hotspurs, Chelsea, Arsenal and now Paris Saint-Germain, all away from home which shows how much Solskjaer has turned things around at Old Trafford. Coming back to the match, PSG really caused their own downfall in this one, but that does mean that Manchester United didn't have a plan. The first goal for the Red Devils was scored by Romelu Lukaku after a PSG defender played a dreadful back pass and put the Belgian through on goal. The Parisians replied minutes after that when Juan Bernat put the French Champions level on the night after he was found by Kylian Mbappe. Manchester United's second goal was scored by Romelu Lukaku after Buffon miss handled a shot from Marcus Rashford and put it on a plate for the Belgian to score yet another brace. The third goal came from a penalty kick and Marcus Rashford slotted it past Buffon. The 21-year-old showed nerves of steel in what was a very nervy moment of the match. Manchester United then held on to make one of the best comebacks in the history of the Champions League. Ole Gunnar Solskjaer told us yesterday. He said there was no such thing in Man Utd's world as a lost cause. He talked about the importance of scoring first and about United's history for late drama. The bloke oozed confidence. Not many people believed him - and he got it spot on. 📈 4th in the @PremierLeague. 🇪🇺 In the Quarter Final of the @ChampionsLeague. 🏆 In the Quarter Final of the @EmiratesFACup. If anything, tonight was an even more extraordinary comeback. Give Ole Gunnar Solskjaer the job right now. No more discussions needed. This is it. Since taking over from José Mourinho, Ole Gunnar Solskjær has made a number of new records as manager of Man Utd. ERIC CANTONA, SIR ALEX FERGUSON AND OLE GUNNAR SOLSKJAER. Ole Gunnar Solskjær is the first Manchester United manager to win a Champions League knockout match away from home since Sir Alex Ferguson in 2010/11. Paris Saint-Germain vs Manchester United 2nd Leg: How can Ole Gunnar Solskjaer's injury-depleted side line up for the game?